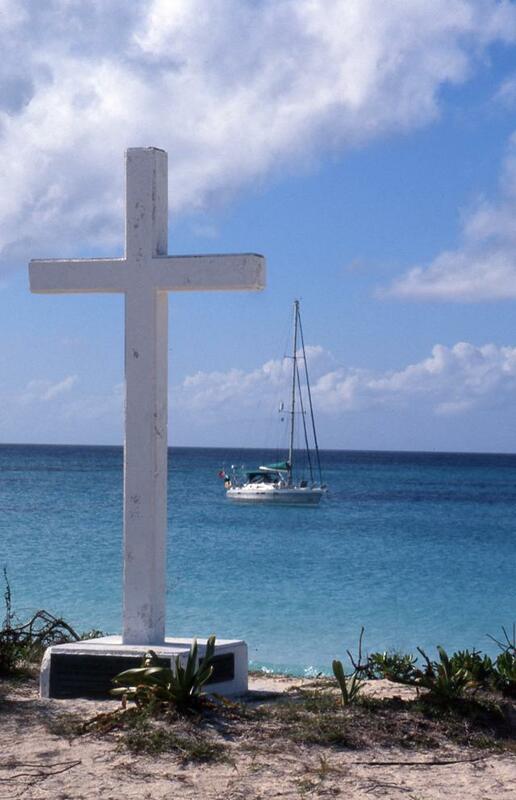 We passed through the Windward Passage on Friday night and entered the Caribbean Sea. By Saturday morning, the wind had gone light and we decided to hoist the spinnaker to make some speed towards Panama, now some 600 miles away. With the automatic pilot doing all the work, it is now an opportune moment to introduce Charlie Doanne, who joined Aventura for this passage to Panama. 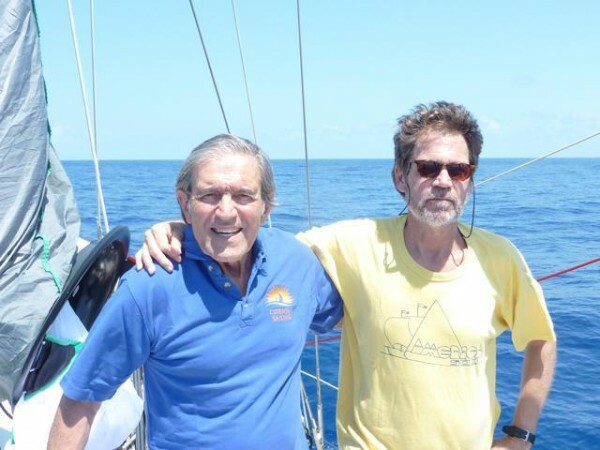 I have known Charlie since 1992 when he sailed in America 500, the transatlantic event which I organized to commemorate the 500th anniversary of Columbus’s first voyage to the New World. We had a feeder rally for America 500 starting in St Augustine, Florida, the oldest Spanish settlement in the United States. Altogether some 40 US and Canadian boats sailed the Atlantic from west to east to join the start of the main event in Palos, in SW Spain. Charlie was sailing on Constellation, a 90 foot Alden schooner built in 1932 and most certainly showing her age. A few days after the start they started taking on water in such quantities, that they were forced to turnaround and have the boat repaired. 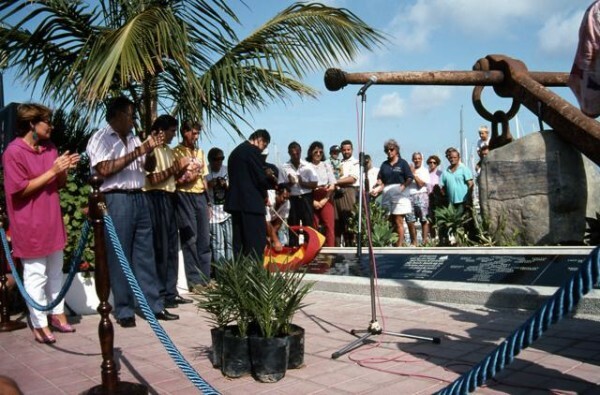 They set off again, and arrived in time for the official start of America 500 on the historic date of 3 August 1992 and from the same spot that Columbus and his three ships had left 500 years earlier. 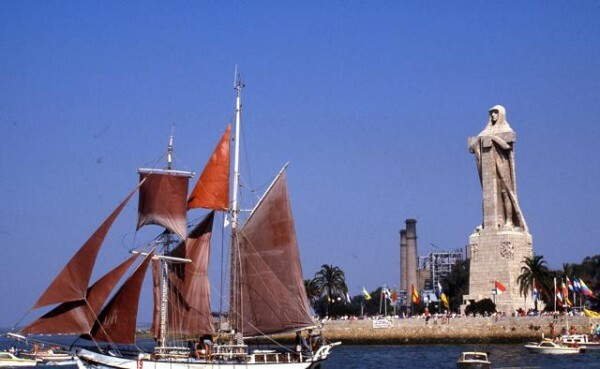 Unfortunately Charlie’s voyage came to a premature end when Constellation strayed out of the navigable channel of the River Odiel and ran aground in front of the Columbus monument, and under the eyes of King Juan Carlos and Queen Sofia who had flown from Barcelona to witness the start of America 500. Having run aground at high tide, Constellation fell over when the tide went out, was filled with water, and declared a total loss. 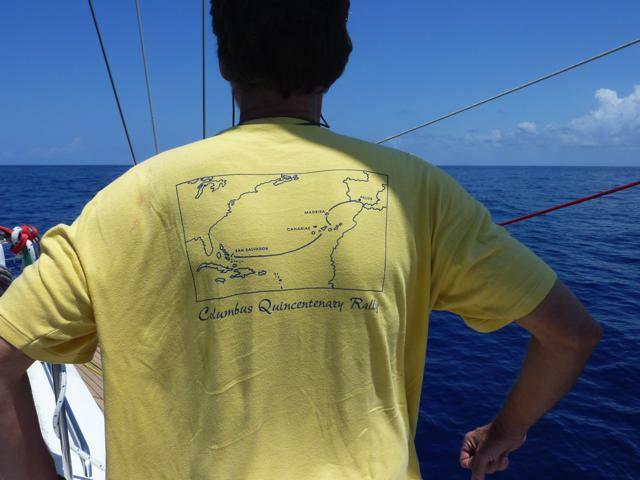 Undeterred, Charlie joined another boat sailing in America 500 and reached the Canaries for the start of the transatlantic leg of the event, which he sailed on Antipodes, a Taswell 56 from Australia. A total of 147 yachts crossed the Atlantic along the historic route and made landfall in the Bahamas island of San Salvador where Columbus and his three ships made landfall themselves on 12 October 1492. Although a lawyer by profession Charlie enjoyed his adventures so much that on his return to the United States he bought a yacht and cross the Atlantic both ways again. He then joined the magazine Cruising World for a while before switching to SAIL magazine, where he has been working since 1999. He is now the cruising editor of that magazine that awarded Aventura, an Exploration 45, built by Garcia Yachting, in France, the prize of Best Boat 2015. Twenty-three years after we first met, Charlie accepted my invitation to sail on Aventura and, I guess, find out for himself if that award was indeed justified.